It’s 2019 and we cannot imagine a world without a stable internet connection. Moreover, we have got so used to being online, that our computers are far from being enough for us now. Tablets and smartphones are everyone’s favorite gadgets nowadays, and they require a wireless internet connection, which we have instantly fallen in love with. Only a decade ago, a wireless connection, or WiFi, was reserved for our homes and just a couple of modern facilities. Nowadays, however, it’s hard to imagine a shop, mall, restaurant, or any facility at all that doesn’t provide free WiFi. Therefore, we are used to being connected at all times, and when we find ourselves in a situation where a viable internet connection is not at our disposal, we start to panic. For example, when we are traveling, and we are visiting cities or countries that aren’t very modern or developed, we might find it hard to get a free wireless internet connection. So, is there a way to get free WiFi anywhere? Sure there is! If we got you interested, keep reading. 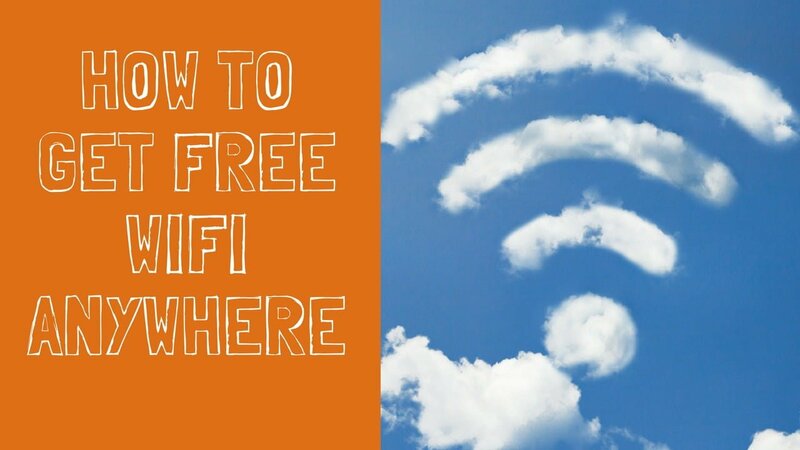 We have put together a list of the best nine ways of how to get free WiFi anywhere in the world. If we are planning a trip to a nearby city or a foreign country, and it’s important for us to stay connected, we should do some research in advance. When it comes to our city/region/country, we already know which hotels, restaurants, and coffee shops provide free WiFi. So if we are visiting a place similar to our hometown, we shouldn’t have much trouble finding a place that will allow us to stay on the radar. However, if we are going to a foreign country, things might be a bit more complicated, especially if that country has little or nothing in common with what we are used to. Still, there are many things we can learn by using the internet. We can find out which stores, hotels, and cafes are the most popular ones in the city/country we plan on visiting. Such places are bound to have free WiFi. There are a couple of apps available for both iOS and Android users (some are free and some are not) that can tell us exactly how to access a free WiFi network anywhere in the world. This enormous global network of hotspots can spot more than 20 million hotspots all over the world. Their goal is to turn residential routers into hotspots. In order to use Fon, we need to purchase a $50 Fonera router, which will split our bandwidth in two. We will be able to use the majority, and the remainder will be used by nearby Fon users. Also, if we own a broadband subscription from some of Fon’s partners, we will be able to connect to Fon and find free hotspots anywhere in the world. With over 100 million WiFi hotspots in its global database, WiFi Map is one of the biggest and most well-known apps of its kind. It is free for both iOS and Android users, and it provides tips, passwords, map navigation, and customer support. Free Zone is one of the most convenient apps for Android users. It can automatically tell us which of the hotspots around us are actually working. Moreover, we can access WiFi networks from local restaurants’ or coffee shops’ hotspots by utilizing passwords shared by other users. Also, the app will notify us whenever we are near one of the 5 million hotspots in its database. Other popular apps that can help us find a working WiFi network include WiFox, Instabridge, and even Facebook. The safest way to use a public wireless network is to connect to a reliable VPN before we join the free WiFi network. A VPN allows us to encrypt our data; that way, hackers who try to access our data on a public network won’t be able to do anything with it, due to the encryption. Moreover, using a VPN allows us to prevent malware from affecting our devices, as well as auto-detect any malicious traffic. Finally, annoying ads won’t be a problem anymore, as VPN’s ad-blocking feature prevents those from popping up on our browser. Most cable companies offer free hotspots all over the city. So, if we are using cable internet at our home or at the office, we should make the most of their free WiFi hotspots. Checking our cable company’s website will give us all the information we need. In order to provide easy access to their network, they usually provide hotspots at places such as airports, restaurants, or hotels. Moreover, some cable companies have specialized apps that can make our job of finding a free WiFi network even easier. Many businesses offer free WiFi to those who agree to sign up for their loyalty program. As most of these programs are free, the idea isn’t bad at all. All we need to do is install a good spam filter so that we don’t have to deal with annoying newsletters they will keep sending us once we sign up. If we can’t find free WiFi anywhere near us, we can check if paid hotspots offer some sites for free. Some airlines, for example, allow us to access certain websites such as People Magazine, Amazon, or The Wall Street Journal, free of charge. While that isn’t ideal, it will at least help us kill time until we find a free network. Going abroad doesn’t only mean exploring the city and visiting popular sightseeing spots, it also means making friends. Getting to know the people will give us a better idea of the country we’re visiting, as well as of their culture. Also, it will give us free WiFi. Our new foreign friends can give us multiple tips about free WiFi networks in their country. They probably know which places offer free WiFi and where the internet is the fastest. Moreover, they can share their own internet connection with us, by making a router of their smartphone and letting us use their data. Every city has at least a couple of cafes, patisseries, or snack bars where people love to stop by and take a break. Whatever our itinerary is, we need to refuel every once in a while. It’s best to take a 30-minute break and sit down for a drink or snack. That way, we can ask the barista/server for the WiFi password and enjoy the free internet while we rest. In our modern world, everyone is looking for ways to stay connected while they are away from home, or just outside, and every businessman realizes the importance of offering free WiFi. Thus, the majority of these places ought to have free WiFi networks. Also, we can come back a few days later and still use the free WiFi without having to pay for a snack or drink again. We can just find a nearby place where we can sit and relax, and still catch the signal. With a bit of patience and some creativity, we can easily access many protected WiFi networks. It has happened to all of us – we go to a coffee shop, restaurant, or a bar, we order something to eat or drink, and we ask the staff for their WiFi password. When they tell us, we get very surprised at their lack of originality. Many public places choose something utterly simple and predictable for their WiFi password. For example, the network’s name and the password might be the same, or they just add “2018” or something like that. Also, we have heard the “123456789” or “987654321” at least a few times when we asked for the password. So, trying to guess the password doesn’t sound like a bad idea at all. Moreover, it doesn’t sound like a difficult one, either. Free WiFi is great – we all love using it. After all, it’s the best (and cheapest) way to stay connected, wherever we are. But, most public hotspots are set up for convenience, and security isn’t at the top of their list. So, we should be careful whenever we access a public network. Once we connect to a public WiFi, malicious third parties can track everything we do. That sounds very troubling indeed, but there are ways to protect ourselves. When we connect to our home/work network, turning on public network sharing is fine. However, with a public network, that’s not the case. If we fail to turn off public network sharing, we are giving hackers an opportunity to access all the information on our devices, which can have terrible consequences. Annoying notifications and pop-up commercials often make us disable our firewall. However, when we are using a public WiFi network, it’s essential that we enable it. By using a VPN service to connect to a public WiFi network, we will make sure that our IP is hidden and our connection fully encrypted. Malicious hotspots can leave us vulnerable to countless hackers, so it’s best to check if the open network we are about to join is authentic. The simplest way to do that is to ask an employee if the WiFi is hosted by them or not. I hope you enjoyed our tips on how to get free WiFi anywhere in the world. Please share your tips in the comment section. Copyright © 2019 Private Proxy Guide.